I think I’m starring in my own reality sit-com and I’m the only one that doesn’t know. You know how sometimes on a sit-com there will be a big guest star that plays themselves; like when Frank Sinatra made a guest appearance on Who’s the Boss? Well on one of my real life sit-com episodes, my inspiration, Jillian Michaels, made a cameo. It was one of those typical days, where something happens that makes it not a typical day. I got a text from my trainer and good friend, Greg Rando, that read “Jillian Michaels is going to be filming a TV segment at the gym this morning. I know you like her, so thought you’d want to know.” Like her? Yeah, you could say I like her, or you could say love, admire, am inspired by, but “like her” works too. I used to love watching Jillian on The Biggest Loser, I’d read all her books, do her workout DVD’s, and now unbelievably, she was going to be at MY gym! I think the risk of meeting a celebrity idol, in particular, is risky, as what if they aren’t really nice in person? Imagine the classic Coca-Cola commercial if Mean Joe Greene, was really mean, and turned into Foghorn Leghorn, and instead of tossing the kid his jersey when the tot handed him a Coke, he yelled, “Go, I say go away boy, you bother me!” In any event, I just planned on hopping on a treadmill and watching my favorite TV trainer from a distance. Fate had other plans. As I got to the gym, they were wrapping up filming. The gym owner, Dave, was by the doorway entrance, and knew I was a huge fan, and nudged me and said, “Go up and ask her for a picture.” I said, “I would never! I just wanted to see her in action.” He said, “You love her. Ask!” Just then, Jillian and her entourage were heading towards the door. As she got to about where we were standing, Dave literally shoved me directly in her path. I stood there…star struck, like a deer in the headlights, instantly turning into a tween meeting Taylor Swift. What else could I do? I said, “Um, Jillian, I’m very sorry to bother you, but I’m a big fan.” Thinking “God, did I just say that? !” Too late to run now, I went on to say, “I lost 96 lbs. and you were a huge inspiration to me.” Maybe it was that I was practically shaking, but she couldn’t have been nicer to me. She said she never would have guessed I had ever had that much weight to lose, and how great that was to hear. We spoke for a few minutes, and she very graciously took a couple of pictures with me, and you can see for yourself, I wasn’t joking about that deer in the headlights look, but in fairness, I had been really sick the past few weeks, and wasn’t expecting my idol photo op! I got the chance to tell her how in a world where everyone walks on eggshells to avoid offending someone, that I loved how she didn’t accept excuses from the people she trained, and was unapologetic for telling them what they needed to hear. She laughed as I told her I cheered out loud when she would give people hell in order to help them. It was a fun exchange, and I’m very grateful for Dave’s nudge. 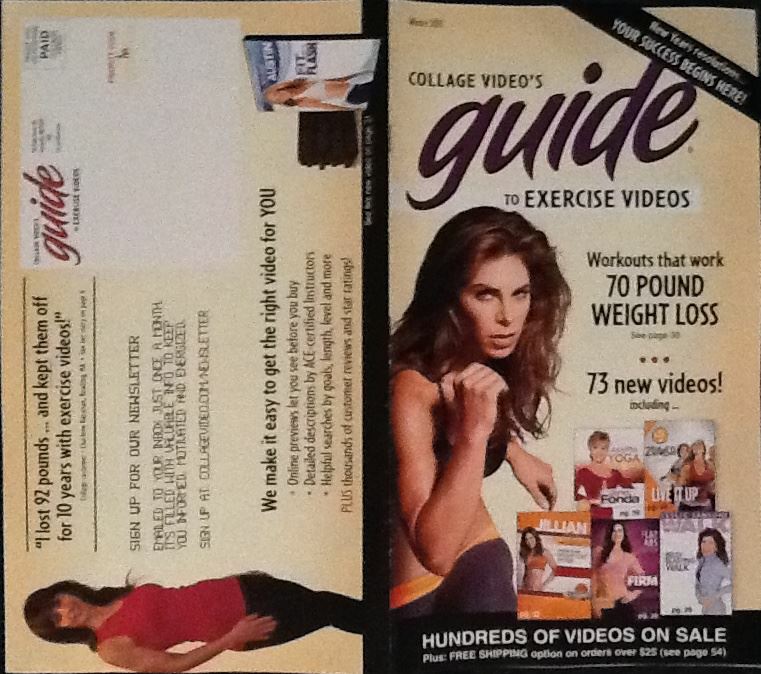 Since then, I was featured in Good Housekeeping as a weight loss success story, and Collage Video did a follow up feature on me for keeping the weight off, and put my story on the back cover of their catalog. To my delight, Jillian was on the front cover. It’s a mini bucket list item one day to get her to autograph a copy of the catalog, should fate shove me in her path again. I was lucky enough to go to Jillian’s Maximize Your Life Tour. Someone from the crowd threw her a “Boston Strong” T-shirt as it was shortly after the Boston Marathon Bombing and she promptly put it on. It doesn’t cost anything to be nice. I like to quote my college professor when he said, “It’s easy to play Santa Claus at Christmas. It’s the day to day actions when the spot light isn’t on, that tell you someone’s character.” I’m sure Jillian wasn’t planning on the wardrobe change, and she certainly could have been abrupt or had her people shoo me away, but instead she made me an even bigger admirer. I even recently signed up for Jillian’s Body Shred Instructor Certification Class, and yes, it was as hard as you’d imagine it would be. I think having a role model or inspiration is a great tool when you’re trying to motivate yourself. I remember hearing a Tony Robbins quote that said, “If you want to be successful, find someone who has achieved the results you want and copy what they do and you’ll achieve the same results.” I’m very glad that the woman I chose to try to emulate a bit, in all the gyms in all the towns in all the world, walked into mine. Now many years ago, my mother and father were in a drug store in New York, and they saw Pearl Bailey reading a magazine. My mom started to go up and talk to her, and she loves to say how my father stopped her and said it’s better to leave celebrities alone and not bother them. She still laments that she listened to him. (Another time, I’ll tell you how my father got to meet Judy Garland.) I know Angelina Jolie and Brad Pitt could be having coffee at the table next to me, and I would heed my father’s advice and not bother them, but you have to recognize a guest star’s appearance when it’s literally right in front of you! p.s. 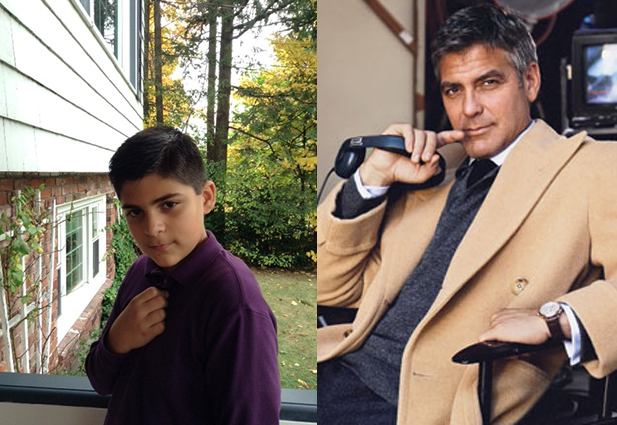 While Brangelina are safe from my attempts to join them for coffee, if I ever see George Clooney, I’m going to show him a picture of my middle son, and say, if you ever need someone to play you as a teenager in a film, here’s our number! See for yourself!